It's Halloween! Peppa is very excited- everyone loves Halloween! It's time for the Halloween pumpkin competition at playgroup and Grandpa Pig has grown Peppa a really special pumpkin. The trouble is, it's a little bit too big to fit in the car. . . In fact, it might just be the Biggest Pumpkin in the World! Will they be able to get it to the pumpkin competition in time? 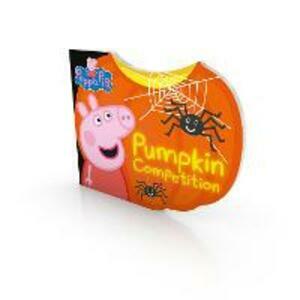 This pumpkin-shaped board book is the perfect Halloween treat for fans of Peppa and George.